Before this week's post begins, be sure to check out my latest video: Le No Makeup Look- Defined Eye. In the video I show you a variation on my usual le no makeup look where I add subtle drama to my eyes. To see the video click here, look in the sidebar of this blog or visit my channel: www.youtube.com/TheDailyConnoisseur. This post comes by request from Sandy who asks advice for the upcoming travel season on how to pack toiletries and makeup bags for travel. We are a family that travels a lot so I will share my tips for efficient traveling with toiletries and what I keep in my own cases (however inadequate they may be). I always have my toiletries bag packed and ready to go at a moments notice. There is nothing more tiresome (or ‘tarsome’ as E.F. Benson’s Georgie would say) than packing at the last minute, stuffing toiletries into a travel bag only to realize you’ve gotten to your destination and forgotten deodorant or your specific shade of foundation. I keep both my makeup and toiletries bag stocked at all times with everything I could possibly need. I know that all I need to do is pack the bags into my suitcase and I have nothing to worry about. If I run out of something I replace it instantly so I never have to double check to make sure everything is there. My travel toiletries bag is the clear travel case from Victoria’s Secret pictured above. I got it on sale a few years ago and have been very pleased with it. I like being able to see what is packed in my bag. Nail polish remover pads- These are critical as well. You may start out the trip with a lovely manicure but your nail polish could chip and you might not be able to touch it up- much better to simply remove it. Clear nail polish and color nail polish- I always bring a clear polish. When I take my color off (if it has chipped for example) it is nice to go over my nails with a clear base coat. It feels more polished than bare nails- especially if you are going out to dinner or to something more formal. I tend to always use a neutral color on my nails (such as Essie's Mademoiselle or Diego Dalla Palma's French Pink) so I keep one of these shades in my case to do touch ups. In the video How I Store My Makeup I briefly showed you my travel makeup bag (pictured above). Many of you were surprised to see that I have such a capsule makeup collection! I suppose I would have more but makeup can be quite expensive so I employ restraint and only get what I absolutely need. Because I usually wear le no makeup look anyway I never need too many items. This holds true for my travel makeup bag as well. Because my travel makeup bag is small, I always keep it with me in my carry-on luggage. You never know when your bags could get lost … All those makeup and brushes are expensive and could be hard to replace depending on how remote your destination is. The following are the indispensable items always on hand. Bronzer- I always have this because when traveling its nice to feel, well… bronzed. And don’t forget your brushes! I do not have separate brushes for travel so I pack my small set of brushes in their travel case and include it in my carry-on. Voila! Those are my travel bag secrets. Even if you do not travel a lot it is a good idea to keep a stocked toiletries bag at all times… you never know when you will be whisked away! I would love to know… what do you keep in your toiletries bag? I was recently contacted by Fresh Produce to review some of their pieces on this blog. Fresh Produce has been operating for three decades making casual, resort and sportswear clothing for women of all ages. As (quality) casual sportswear is what my capsule wardrobe mainly consists of now I was very interested to see their range of clothing. 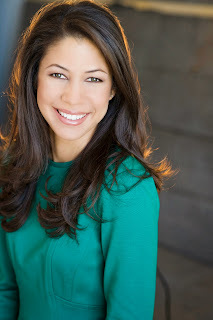 The ME (Mary Ellen) line is my favorite for its youthful, fresh approach to casual dressing. I think dresses are the easiest ways to look presentable because they are one outfit in and of themselves- you do not have to worry about finding a top or bottom that go together. All you need to do is select the right shoes and jewelry and you are done! The Bali Shine On Shirtdress in Black. They are made of a quality fabric that is 95% rayon and 5% lycra. The fabric has a certain heft to it- not flimsy at all, which I appreciate in a dress (so I don’t feel like I’m wearing my pajamas, you see). The fabric does not wrinkle, making the dresses perfect for packing in a suitcase or traveling with. The details of the dresses are really unique- the fabrics are all hand dyed and are each different and vary from one piece to another. The ethnic inspired prints are bold but not overpowering and are easy to accessorize. For my budget, the dresses are offered at a reasonable price point. I have bought a lot of jersey dresses in the past (because they are so easy to wear, comfortable and presentable) but I usually paid a lot more for them. A lot of my dresses, for example, come from Velvet, Splendid or BCBGMaxAzria and usually cost between $130-$150. These dresses all fall around the $85 range, yet the quality isn’t compromised in the least. So all in all I am very happy I found this brand and will be ordering from them in the future! The clothes are all made in the U.S.A. but aren’t only available in America- they ship to over 200 countries around the world. The outfits are true to size so if you order make sure you check out their size chart. Because I have very dry hair I do not wash my hair everyday (per my stylist’s recommendation). I wash my hair every two or three days. When I wash it I usually blow dry it. Doing so gives my hair a softness and presentable manageability that lasts. Microfiber Spa Turbans are great! I’ve passed them for years in Bed, Bath & Beyond and beauty supply stores and always thought they were a gimmick- what was wrong with using a regular towel? But the spa turbans actually extract a lot of excess water from the hair, making the hair easier to either towel dry or blow dry. Using a heat protectant is essential. I found Kérastase Nectar Thermique and will not look back. I love it. The T3 Featherweight hairdryer is excellent. It uses a patented Tourmaline technology to dry hair 60% faster than the average hair dryer. It is also very durable as I have dropped it several times on my hard, marbled floors and it has not broken! Like the Clarisonic, I waited a long time to get the T3 (because it is rather expensive at $200) but I am happy I did. To see the T3, click here. Shine spray is a wonderful thing for someone like me who does not have naturally shiny hair. I use: Catwalk by Tigi Your Highness Weightless Shine Spray. With regards to the “twirl technique” … My stylist Valentino taught me this to keep my ends from getting flat and frizzy: Blow dry the hair as usual and when you get to the ends, twist with your round brush (this technique is highlighted in the video). This will give your hair body, character and bounce. Use Velcro rollers on the top part of the hair to achieve volume and smoothness. The longer you leave in the rollers, the more volume is achieved. In the video I only left them in for about 5 minutes (husband, baby and dog were hurrying me up!) so I did not achieve as much volume as I would have liked. As a final note, this video is set to one of my favorite songs ever written- Nocturne in D Flat Major Op. 27 by Chopin performed by Paul Pitman. I downloaded the song from Musopen (www.museopen.com) , a nonprofit company dedicated to providing copyright-free classical music to the public. I would love to know... how do you blow dry your hair? Future hair tutorials on YouTube will include: Old Hollywood Hair and Velcro Rollers Tutorial… I hope you'll stay tuned! And now for this week’s post. My favorite part about writing this blog and doing the videos are the correspondences with my readers. I love to read comments and get emails from you. We have developed such a marvelous online community. If you have not checked out the comment section for each post or video you must do so as the readers of The Daily Connoisseur (who invariably have excellent taste) discuss books, make beauty recommendations and comment on their experiences with the topics discussed in the blog. This post is devoted to questions and requests I have gotten over the past few months relating to motherhood. So here we go! I would love to hear how you instill these French values with your children. I try to enhance my daughters lives but there are probably so many things I'm missing. 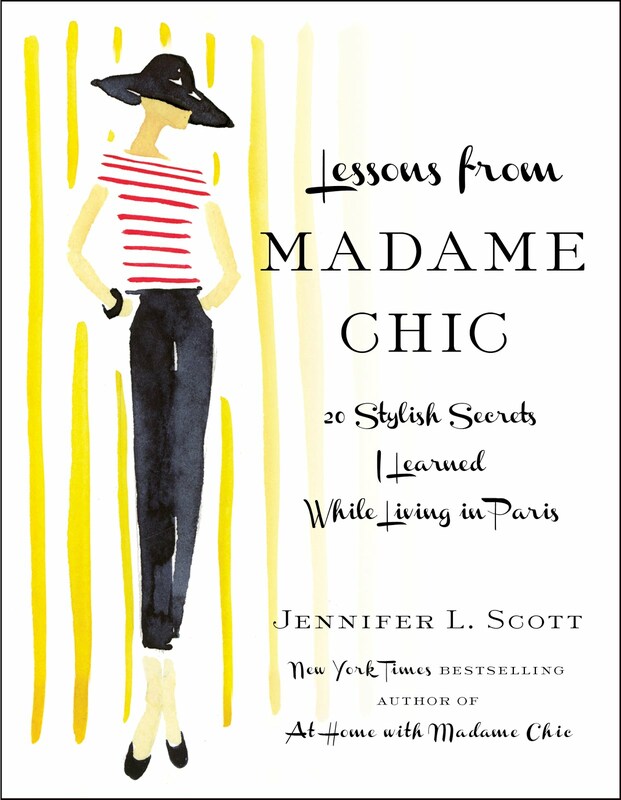 Vicki sent me this request in reference to The Top 20 Things I Learned While Living in Paris series on my blog. 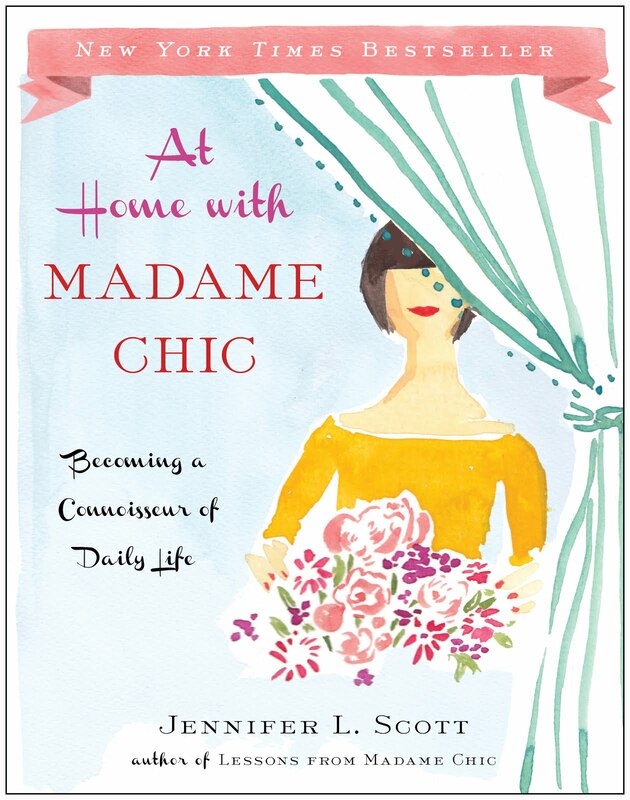 I was lucky enough to learn those lessons from Madame Chic (whether consciously or subconsciously) when I was in my early twenties, but it really took a lot of reflection and becoming the Madame Chic of my own household a few years later to make the lessons actually stick. And now that I have a daughter I am more conscience than ever of how I live and what lessons I am teaching her every day. If, for example, you wished mealtimes in your house were more formal or cherished, then insist on everyone dining together at a certain time- with television off, ringing phones unanswered and music playing in the background. If you would like them to keep their room clean, make sure to do your best (with their help) to maintain a clutter-free home. 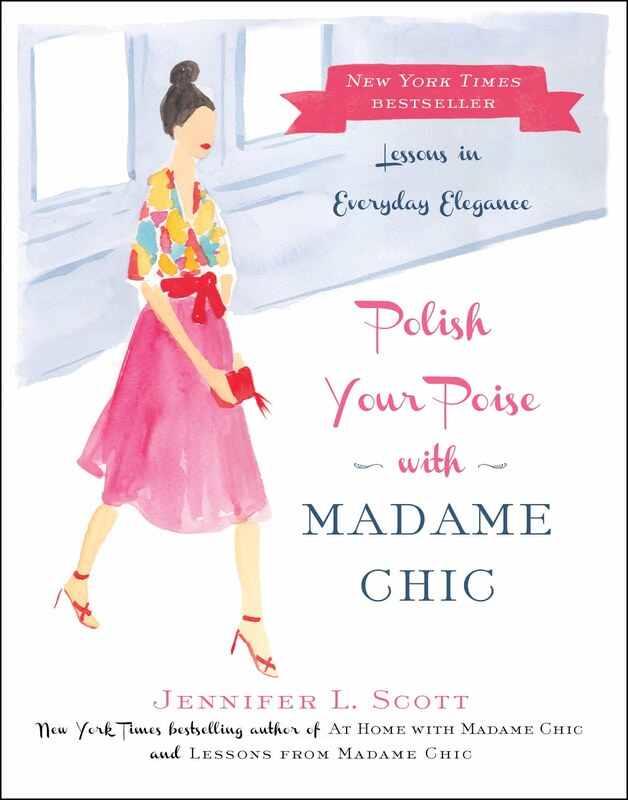 With regards to beauty, style and self confidence- employing le no makeup look, adhering to the tenant of looking presentable always and dressing appropriately for every occasion sets a marvelous example of how to be chic by not overdoing it. The next reader question comes from Jeanne, who asks about how to stay chic during pregnancy and motherhood. Having just had a baby myself (although I can’t believe she will be one year old soon!) I can personally attest that staying chic during pregnancy and motherhood isn’t the easiest of feats. Now that I am finally getting a full night’s sleep again it is easier, but during those dark hours of waking up four to five times a night being chic was probably the last thing on my mind. Although invariably when I would finally get ready for the day it did boost my spirits to not look like a complete and total frump. Having a simple haircut is also essential. I would suggest going to your hair stylist and finding the right cut for you- one that requires the least amount of maintenance possible. Also ask your stylist to show you a few quick updos for everyday use (**please note I will be doing several hair tutorials on The Daily Connoisseur’s YouTube channel as I have gotten a lot of requests for them, so stay tuned for those). And as for le no makeup look- your version of it might go as far as only applying spot concealer, mascara and lip gloss, or if you have more time you could add tinted moisturizer and blush… every little effort counts. I will do my best to honor them in a timely manner. I spend an awful lot of time and attention taking care of the skin on my face and neck. I try out numerous products, slather myself with the best creams and serums, wear sunglasses and sunscreens, do research on the latest technologies, religiously use my Clairisonic and get regular facials. Phew! This is all in the attempt, of course, to be, well, beautiful. I want to have perfect skin and I want it for a long time. I long to age gracefully and to do everything I can to make that happen. But what about the rest of my body? I give the rest of my body only a fraction of the attention that I pay to my face and neck. I was recently reminded of this by Marguerite, a reader of The Daily Connoisseur, when she reminded me in the comment section of a Le No Makeup Look post about the importance of wearing sunscreen on my hands and arms on a daily basis. (I admitted I only use sunscreen on my face and neck). While I don’t have any age or sunspots now, that might not be the case in a couple of years and prevention is the best course of action… while there is still hope! Marguerite’s comment got me thinking (thank you Marguerite!) What is the point of spending so much time preventing sun damage and aging of the face if we do not do the same for the rest of the body? Only giving special attention to your face and neck would be like dressing for the day and not looking at yourself from all angles before stepping out the front door. Perhaps there is a rip in your stockings from the back or a hole in your trousers! I was reminded that it is important to look at the whole picture with regards to your beauty regimen. Right about the time when this was all happening I was contacted by La Isha, an all natural holistic skincare company wanting to know if I would be interested in reviewing their product Breast SOS (pictured above)- a topical serum derived from essential oils that helps maintain the beauty and health of the décolleté. The offer to review really could not have come at a better time because I started to think about my décolleté which has also been sadly neglected my whole life. I’ve never done any beauty treatment or preventative measure to that area. And while it looks just fine now, what will it look like in 10 or 15 years? I got back to La Isha and agreed to try out Breast SOS. It was time I started to pay equal attention to the rest of my body. After using Breast SOS for the better part of a month (I apply the serum only at night) I have been very pleased with the results. La Isha purports that it helps tone, firm and rejuvenate chest and breast area, fade age spots, hyperpigmentation, and minimize appearance of fine lines, wrinkles and skin-creases. Now, it is important for me to say that I don’t actually have any of the above maladies yet so I could not report on whether or not the product got rid of age spots or wrinkles in that area. But what it did do for me was help my décolleté feel moisturized, elastic and well, radiant. It has a very potent aroma due to its herbal composition (mainly pomegranate seed oil) and it is for that reason I only wear it at night. Also after applying Breast SOS I would get a pleasing, tingling sensation on my skin in the area applied indicating that something was happening. What that something is- who knows! It’s probably just my skin in that area rejoicing in finally being pampered after so many years of neglect! Breast SOS is a really innovative product. Incidentally La Isha also has an entire great line of skincare including creams, serums and scrubs to target the aging process naturally. I had agreed to review Breast SOS but out of courtesy they sent me small samples of some of their other skincare products. I particularly like their aromatherapy face wash, coconut orange skin polish and their pomegranate moisture booster. Because I only used the small samples for about a week I am not able to do a comprehensive review on them here (I like to try a product for at least three weeks before recommending it). But what I did notice from sampling the skincare products was that they are of a very nice consistency, are very gentle on the skin and did not make me break out (a huge plus for me!) I do need to mention, however, that most of the products have a very potent scent due to their all natural use of botanical herbs and medical grade essential oils. The scent might be strong for some but it is nice to know that there is nothing artificial about the fragrances attributed to the products. La Isha is another great company, run by women, environmentally friendly and with all natural products that is worth exploring. Visit their website: www.la-isha.com for more information or click here to go directly to Breast SOS. Now I realize that taking care of my décolleté has opened the door to an entire world that I have been otherwise blissfully ignoring. The world of neck firming creams, cellulite creams, wrinkle prevention creams, etc. But I do remind myself that finding these special tonics is one of the secrets that French women employ to look great as they age without resorting to surgery. So to that I say, bring it on! I would love to know… with skincare do you focus mainly on the face and neck? Or do you take care of the whole body with equal attention?